If an ink cartridge is low or expended, a message appears on your product and on your computer screen. Note which cartridges need to be replaced. 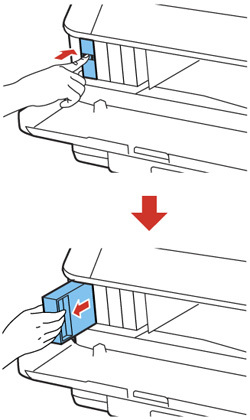 Push the ink cartridge in, then pull it out of the slot. Gently shake the ink cartridge horizontally for about five seconds as shown. Do not remove any labels or seals, or ink will leak. 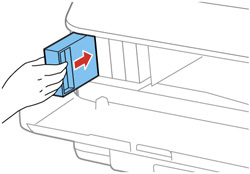 Insert the new cartridge into the holder and push it in until it clicks into place. Select Check on the LCD screen to make sure the cartridges are installed correctly. If you see a message that an ink cartridge is installed incorrectly, press in the ink cartridge until it clicks into place. When you are finished, close the front cover. The product starts priming the ink and returns to its previous state when finished. Note: Do not turn off the printer during ink replacement.